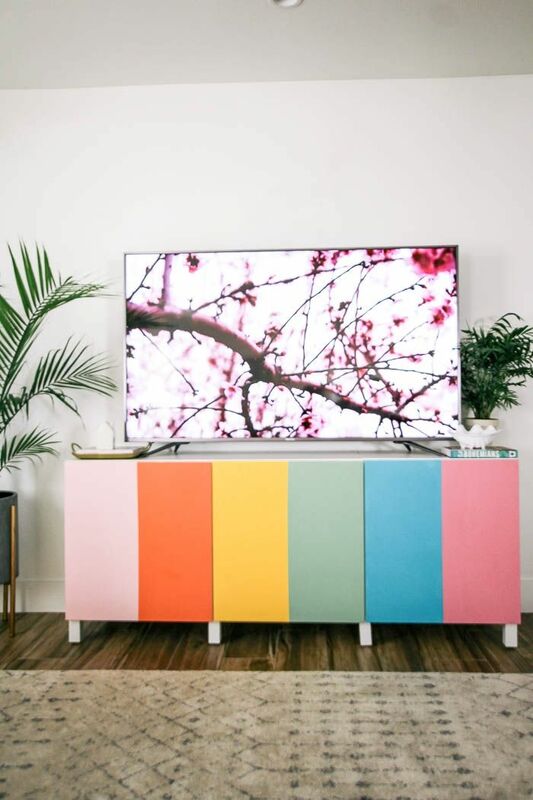 DIY Tv Stand | Electronics as the entertain machine is one of the essential things to have, especially for entertaining ourselves in the safest place like home. There are so many electronics that help us to feel in a good mood such as radio, video game, and of course television. Many people would like to have at least one TV in their house, so there are no wonder people are trying their best to make the area with TV to look as presentable as they could. All just in order to achieve the comfort and relax room for their pleasure. To give you an inspiring ideas for your own DIY TV stand project, below we offer you a showcase of DIY TV stands. It is the most possible and easiest DIY that you can find online! 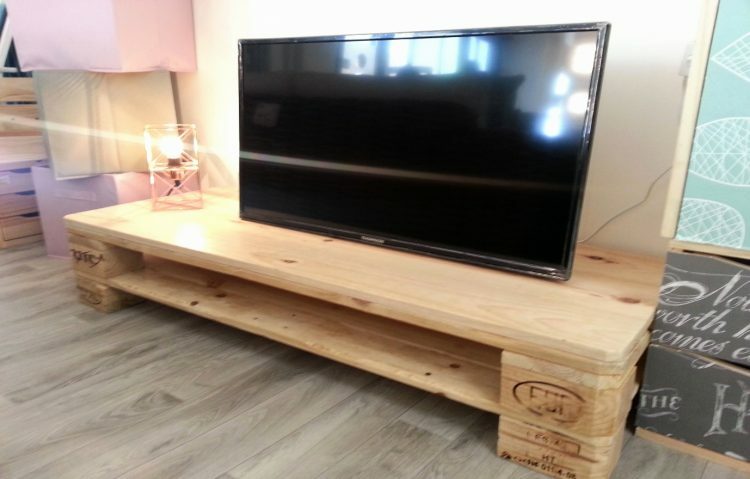 This wooden crates TV stand is not only very easy but it also very popular on the DIY projects world. The material itself may not hard to find in the store. Yes, they are very cheap. All you need is to stack the crates into a good arrangement, then just put your TV on top of it. If you do not like the wooden colour, you can also just paint them. There you have your own TV stand, very simple and easy right? Most the people may struggle to have that empty plain corner in the room and it almost no area to place your brand new TV. If you are one of them, you should consider putting your TV on the corner of the room. 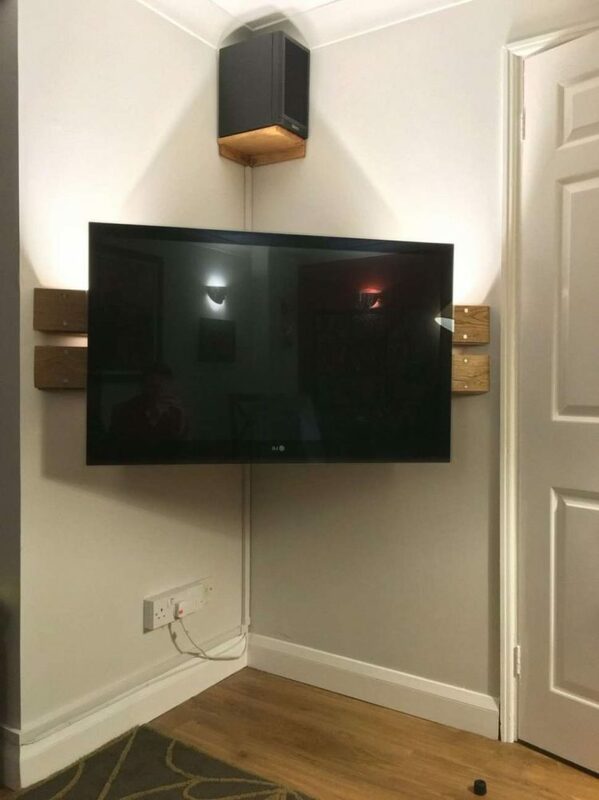 Well, all you need is a cut wood as the straight platform for your TV. Just place them like in the photo above, it is not that hard, right? Wood pallets can be used as so many things. Since they are not hard to find, why don’t you use it as the TV stand? It also works really well with the used ones, just upcycle it! Also, the gap between the two can be used as CD racks. So you may not have to make or buy other drawers for your CD collection. To achieve industrial style as your DIY project, you can just simply choose copper pipe. Use the copper pipe as your table legs and consider to be creative as the decoration like making it as shelves for books or CD racks. The cut woods is also easy to find on your local hardware store. The movable table as the TV Stand might be a great choice for you who loves to watch TV on the different sides. 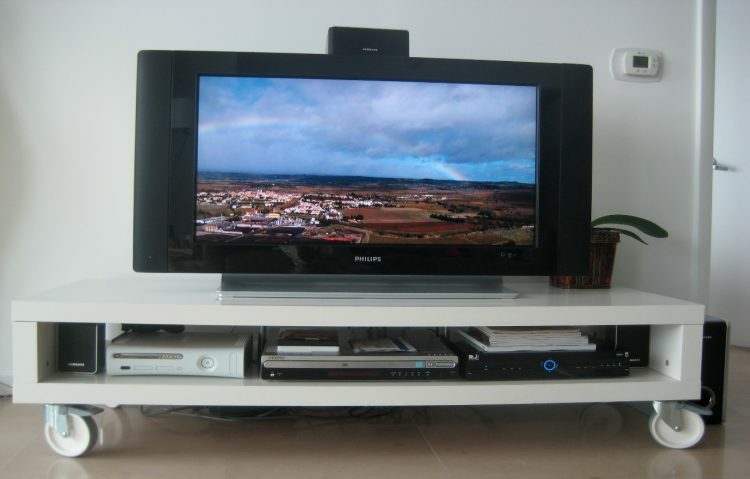 TV stand from the table with wheels is a brilliant idea to solve this problem. All you need is to get cut woods that suitable for your TV and put the wheels on it. There you have your own movable TV Stand. Yup, display easel is used as the painting display. 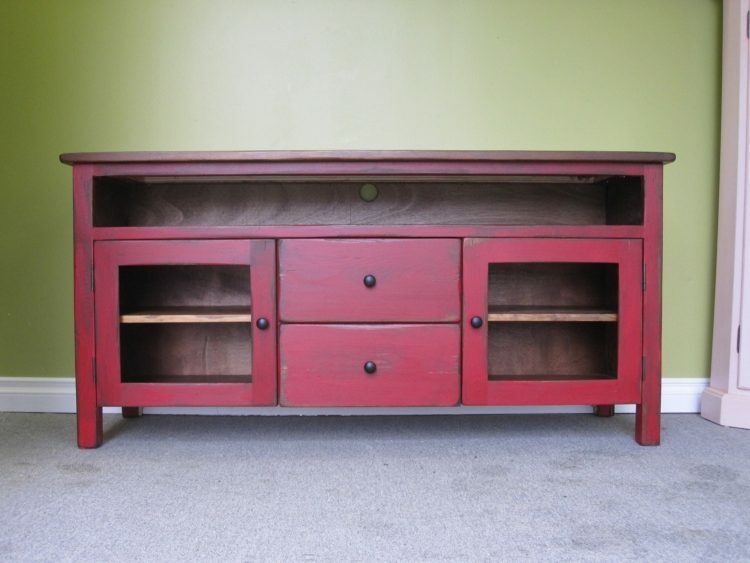 Why not use it as your easy DIY TV stand? It is really easy to find also and easy to make. 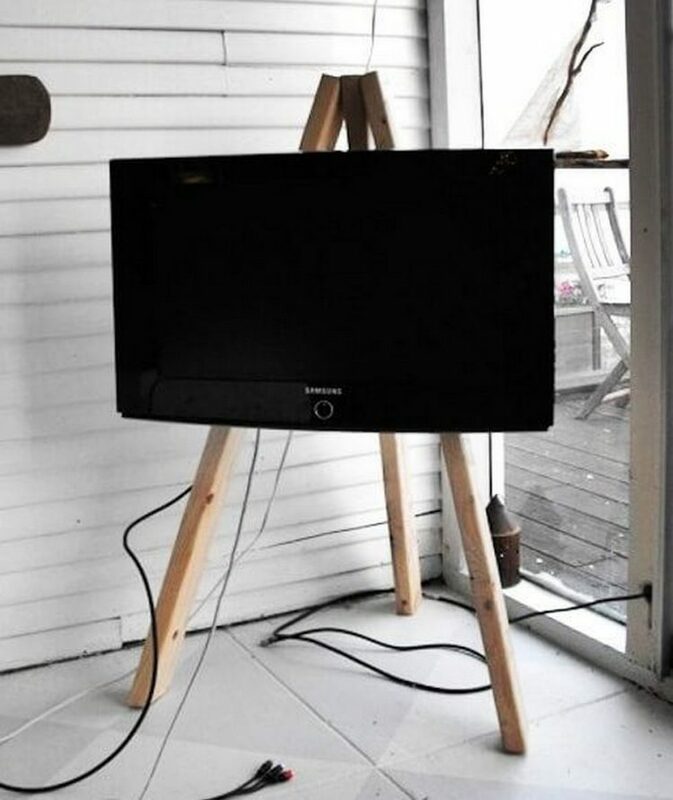 All you need is to get a good size of display easel to place your TV. 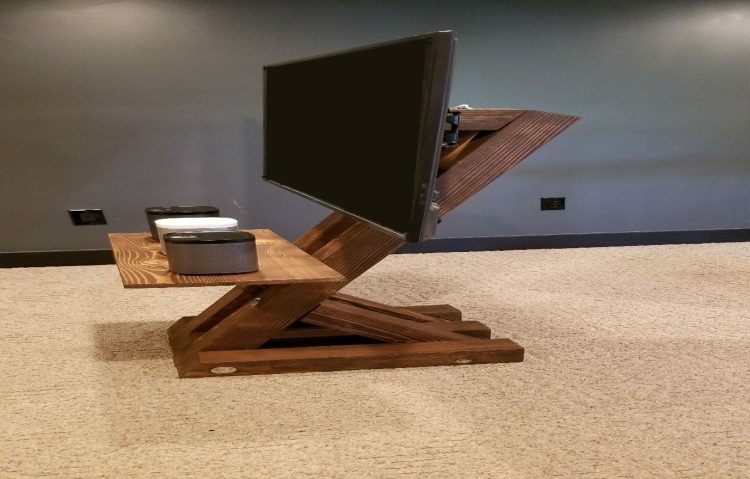 Just for your tips, get the strong wood in order to have a stable stand for your TV. To have a TV stand with a fireplace inside can be the best furniture you have ever made just imagine entertaining yourself while warming your body in the cold winter. 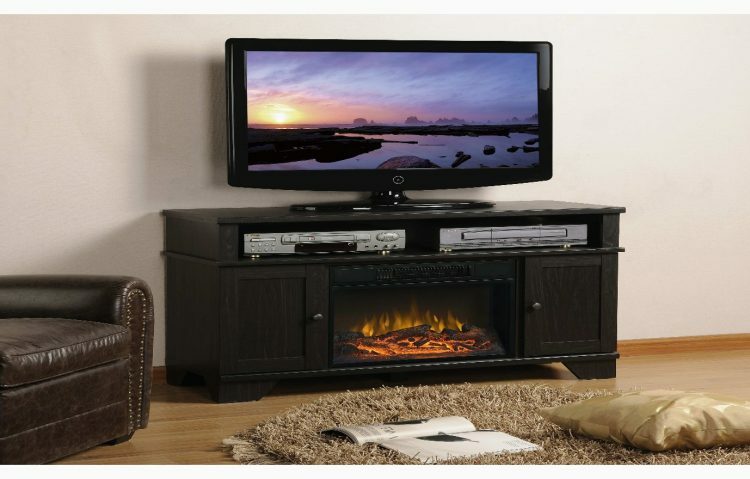 Install the electric fireplace media console under your table. It is a safe place that you do not have to worry about. Farmhouse style is the style that possibly almost everyone adores. The atmosphere of the farmhouse is just very cosy and homy. 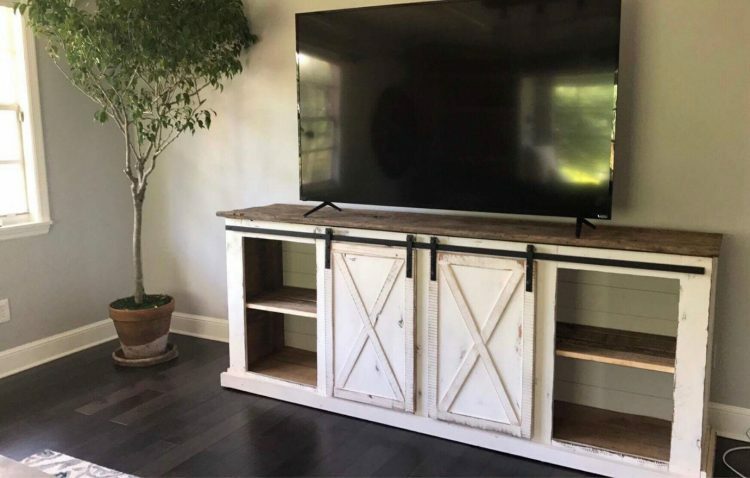 To achieve that look, why don’t you just have your farmhouse TV stand? You can always buy the used table from a thrift store and replace the doors into your own DIY project. 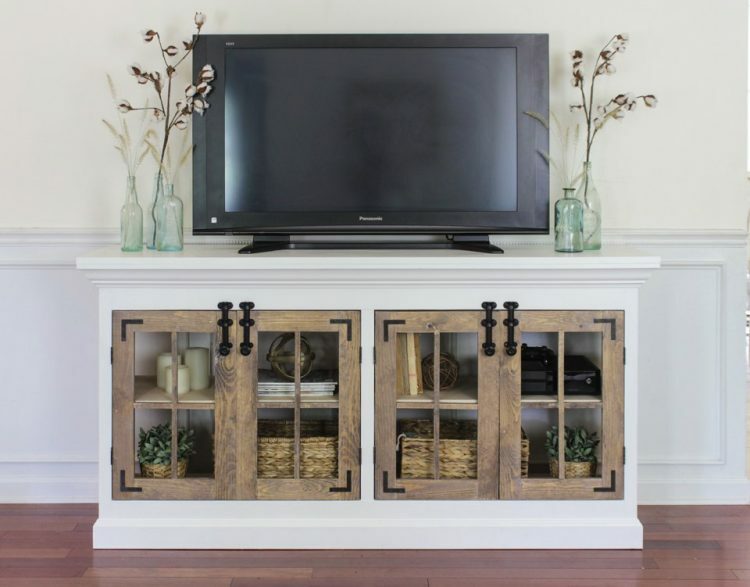 Paint the frame with white and get the wood colours for the doors, this way you will have the modern farmhouse style of the TV stand. Are you not happy with the boring plain looks TV stand in the store? Well, you can just buy the plain one and make it looks colourful! All you need is a sticker paper like wallpaper that suitable for woods or maybe you can just paint them with different fun colours. This idea is very easy and very inexpensive for your DIY project. You may also have to know that there are some woods that will look bad and rough, that’s why you should notice little things. Choose the smooth and strong ones to get a better result! Vintage can be so fun to have! Why not just get the vintage look by purchase the used furniture in the thrift store? The idea like this definitely saves your money. Get the perfect size of the use table as your TV stand and you can also paint them to look like an item of brand new furniture. If you are worried about their dark colours and planning to change it into a vibrant one? Well, the result is also can look really pretty like the photo above. A little stain from the dark colour gives the personality to it! Open racks in your below your TV is sometimes bothering since you may have tangled wires. To solve this problem, you can just put an extra door like a sliding door to make it easier. All you need is to install the materials to sliding the door. 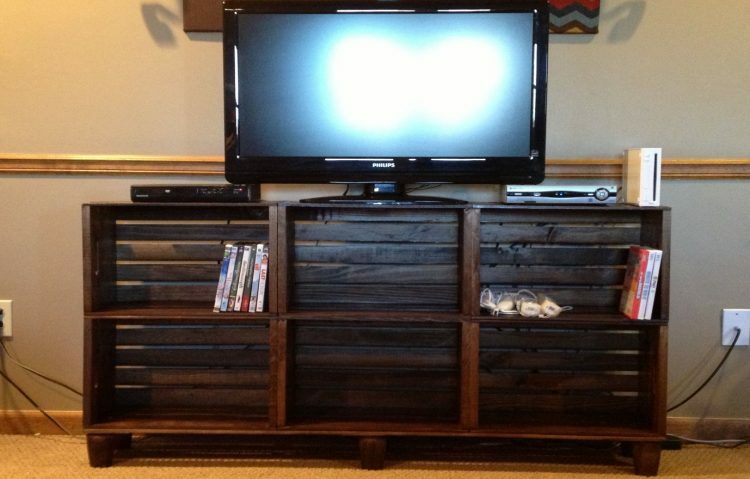 Combining the wooden pallets with wood crates is one of the simple and easy ways for your TV stand. 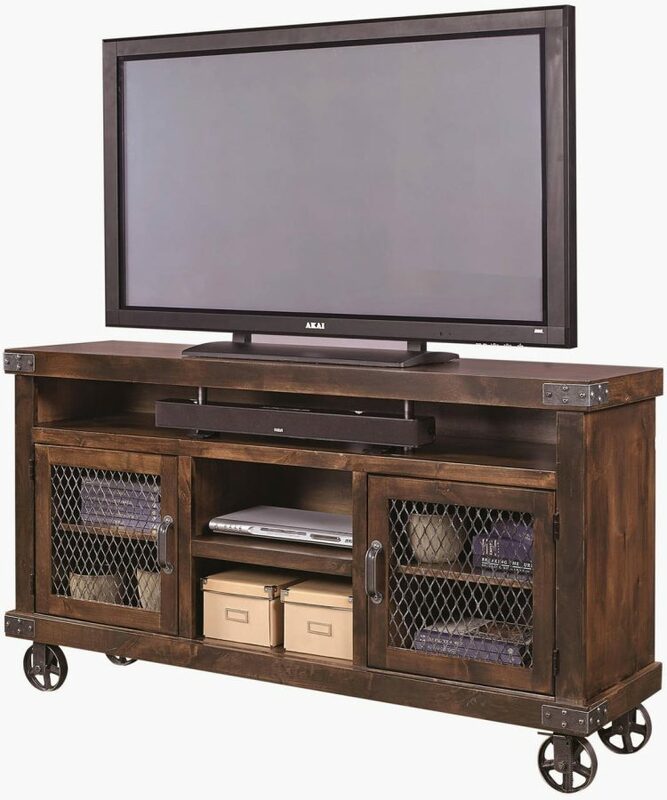 Get wood pallets to make sure your TV is stable to stand up and wooden crates to have racks under your TV. The two materials are very easy to find in the store or you can just simply choose the used ones as recycle furniture. 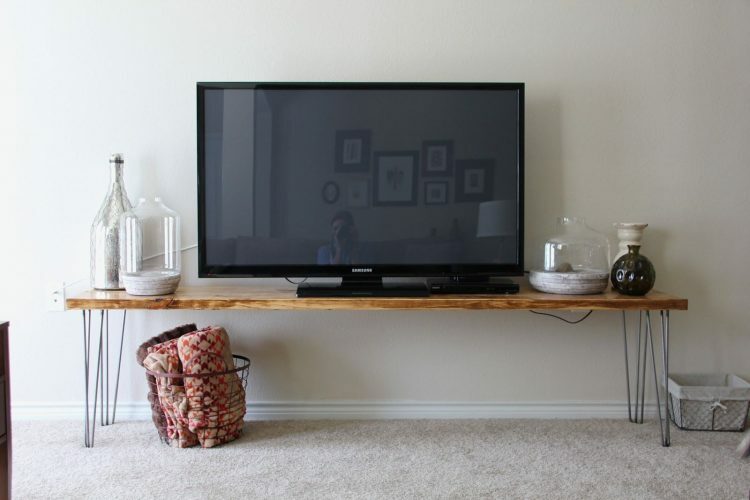 The most inexpensive DIY that you can find for TV stand is probably would be this cut woods. The recycle cut woods as the TV stand helps the tv to look so much taller, this is a good solution for those who have a short table and wish to have taller ones. 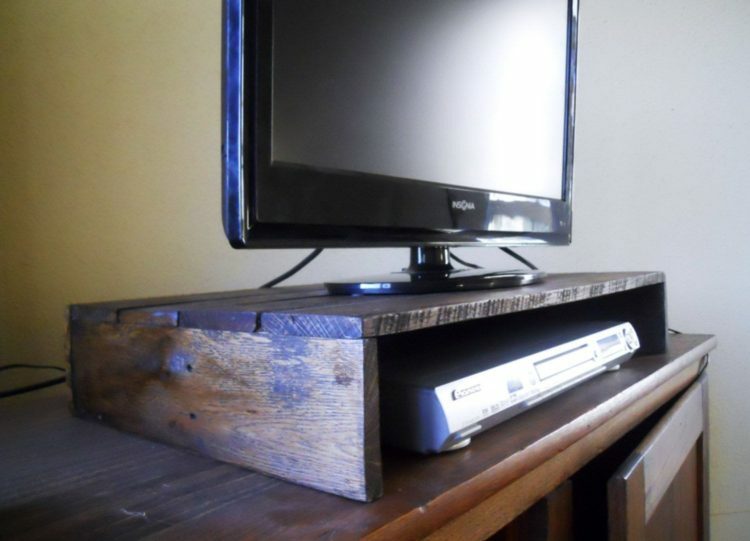 The idea of a recycle tv stand like this helps your room to look and have a rustic style. Well, this is good news for you who loves rustic ideas. The unique idea of x-leg table brings the modern style to your home. It is a little hard to find a unique tv stand design for your lovely room so why not just make one? You may need a little help from a store that can custom the need of your woods and just build them yourself. Do not forget to leave spaces as your storage or racks. the tv stand like this is very suitable for your modern living room style, making it perfect as your own idea is so much better and save more money. What is the stylish design for your tv stand? Can you mention the materials? 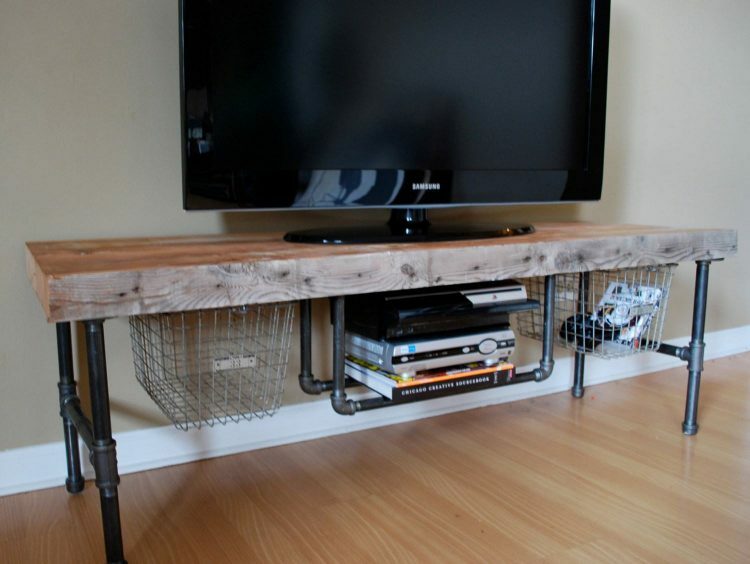 How about the simplest idea you can get for your DIY project tv stand? 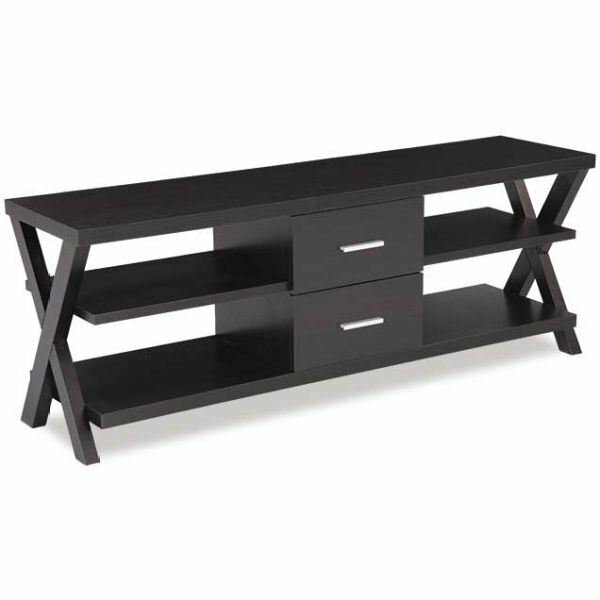 All you need for the simplest idea for your stylish tv stand are cut wood and 4 hairpin legs. 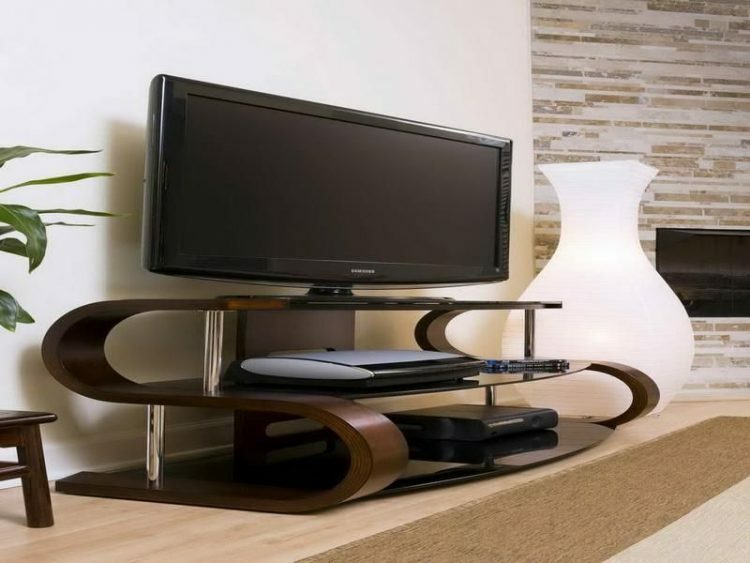 The hairpin legs tv stand like this is very suitable for every modern style for your room interior design. Also, a good thing about this DIY is that the hairpin legs are very easy to find in the local hardware store. 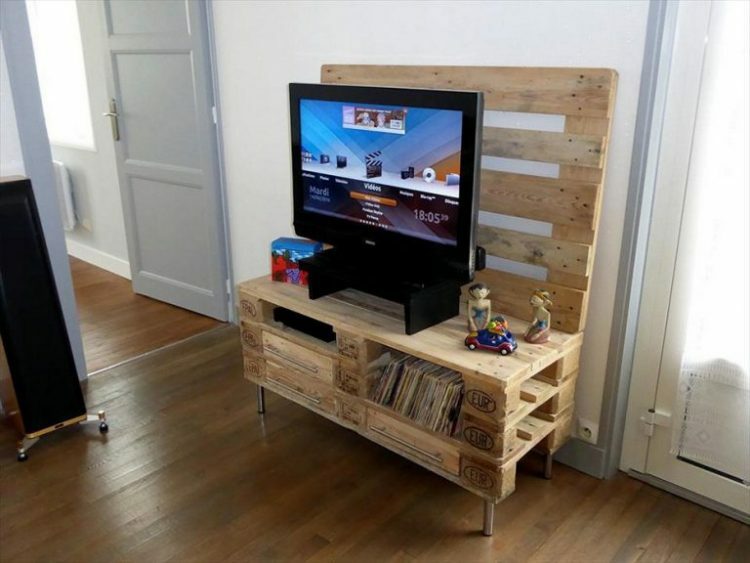 Try to creative with your tv stand can make a pretty awesome result! A tv stand with wood sticks also gives the modern style to your tv stand. The surface itself is very easy to make why don’t just give a little attention to the legs? You only need 4 stick blocks of wood that shaped into look like circles. This idea is not only to give the simple minimalist looks but also it’s not that hard to make one. A little effort that you spend also gives a big difference to your interior design for your living room. If you love to make your own DIY project that very creative and hard. Why don’t you just give a little attention to this idea? The S-shaped legs are looking odd but fun at the same time! Gives your boring living room with the eye-catching tv stand in your room. The table that shapes like this also helps to complete the modern or luxury interior design. Get a little crazy with the style can also give the best result! Concrete is one of the materials that give modern looks to the interior design. The idea of the TV stand with concrete is the brilliant ones but combine the material with glass? It is perfect! All you need is to get concrete as the foundation for your glass surface. That’s it! Just a tv stand that looks stands out and amazing. Another farmhouse TV stand style, only this time may a problem for some people. The big gaps between the top surface to the bottom can look so bothering. 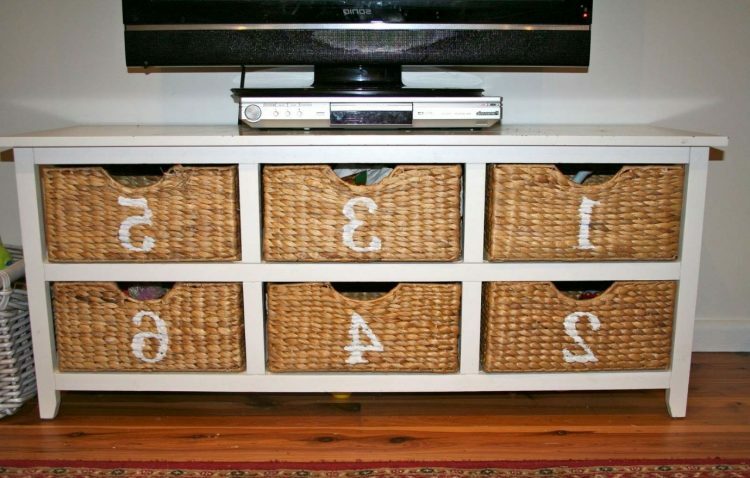 To achieve the farmhouse style just give couples of baskets under as the storage for your living room needs. A little touch for the frame gives a huge different, definitely in a good way! A colour tv stand combining with some LED light, is a good example. The plain room may look boring so just gives a vibrant colour like blue to make accent colour for the living room. You could also make your room look more futuristic with the light. 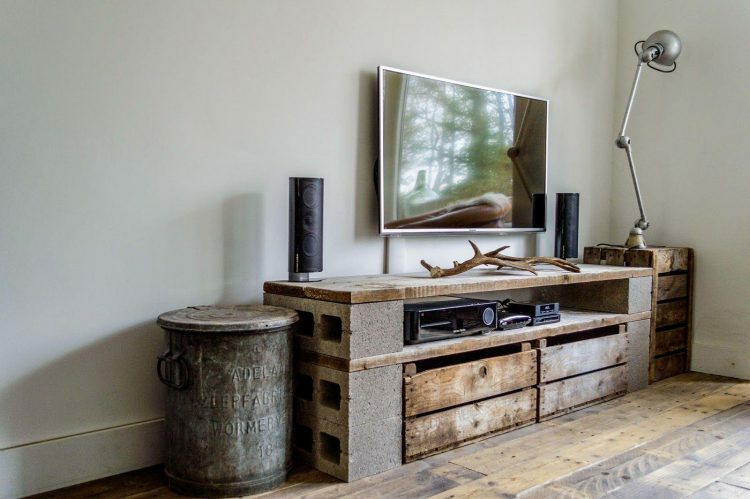 To have an interior design that can be close to nature is a great thing but what is the idea for your tv stand that can look like it close to nature? Definitely cheap materials! The answer is to combine the cinder blocks with cut woods. The idea like this gives the earthy tones and modern touch. If you love the urban or bohemian style, the tv stand idea like this help a lot! Tv stand on shelves can look so boring but this idea gives the solution to the doorway wall! Some people may have the problem of the doorway wall that looks very uncomfortable or it is just not right to put the TV between the door and this idea gives the best solution. 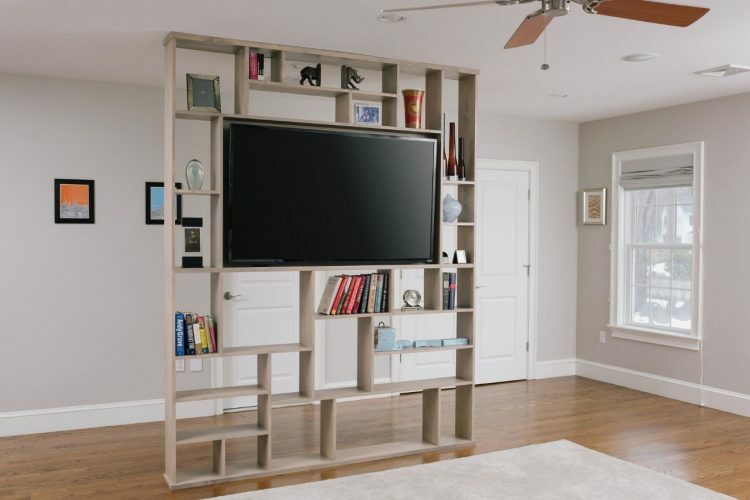 All you need is a giant shelf that also very strong to hold the TV and place it in the front of the sitting area, can be your doorway wall. Also, you can just build the giant shelves with custom cut woods since it is hard to find a perfect size shelf, right? The little changes give a big change! 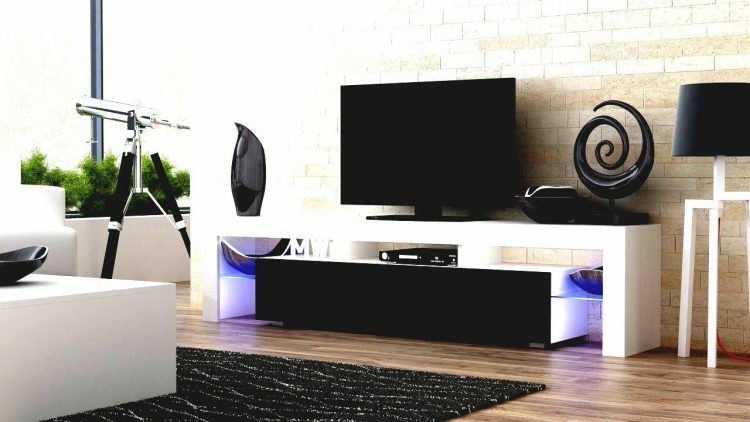 Are you consider to have a floating TV stand? Since it is a simple way to your small room? 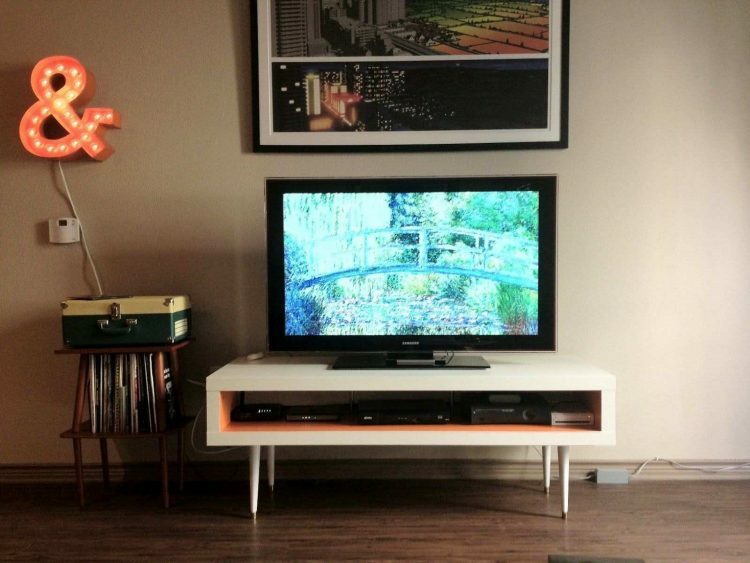 Well, the Z shaped may be the best inspiration for your floating tv stand! All you need is to get a good size of cut woods from the costume hardware store. If you have broken glass doors, you may need this chicken wires to fix it! They’re affordable and works really well to fix your doors.